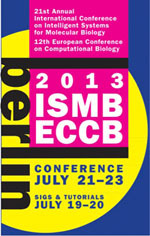 The 12th CAMDA conference will be held in Berlin, Germany from Friday, July 19 through Saturday, July 20, 2013. As in recent years, CAMDA runs as a Satellite Meeting of the Annual International Conference on Intelligent Systems for Molecular Biology (ISMB). CAMDA focuses on the specific challenges and opportunities in the analysis of the massive data sets that are increasingly produced in several fields of the life sciences. 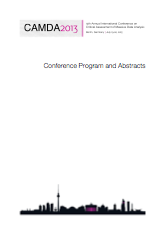 The conference offers researchers from the computer sciences, statistics, molecular biology, and other fields a unique opportunity to benefit from a critical comparative evaluation of the latest approaches in the analysis of life sciences' “Big Data”. Leading scientists from around the world are selected to present their analyses in talks, complemented by poster sessions. Papers based on the submitted extended abstracts submitted for presentation at the meeting are published in the conference proceedings. Starting with 2012, CAMDA has entered a partnership with Landes Biosciences, publishing the CAMDA Proceedings as an open access PubMed indexed special issue of Systems Biomedicine. As in last years, there will be prizes for the best contributed analysis / presentations. The three prize winners will receive a free one-year subscription to F1000Prime (worth $250) and a free submission to F1000Research (worth $1000). The first prize winner will additionally receive the prestigious CAMDA award. CAMDA award We congratulate Marinka Zitnik, Deepali Jhamb, and Ashley Bonner for winning the prizes for the best presentation. The conference dinner will take place at Moorlake. The historical inn, situated at the Glienicker Schlosspark between Berlin and Potsdam, has existed for over 100 years. The beautiful beer garden at the water provides guests, besides a beautiful view on the River Havel, a kitchen with old-Berliner character and many seasonal specialties from the Mark Brandenburg. Transportation to the dinner is included. The bus will leave after the last session and return from Moorlake at 10 pm. 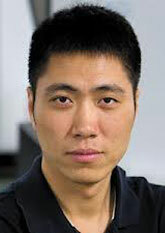 We deeply regret, that Jun Wang will not be giving his keynote, but urgent matters prevent him from attending the conference.